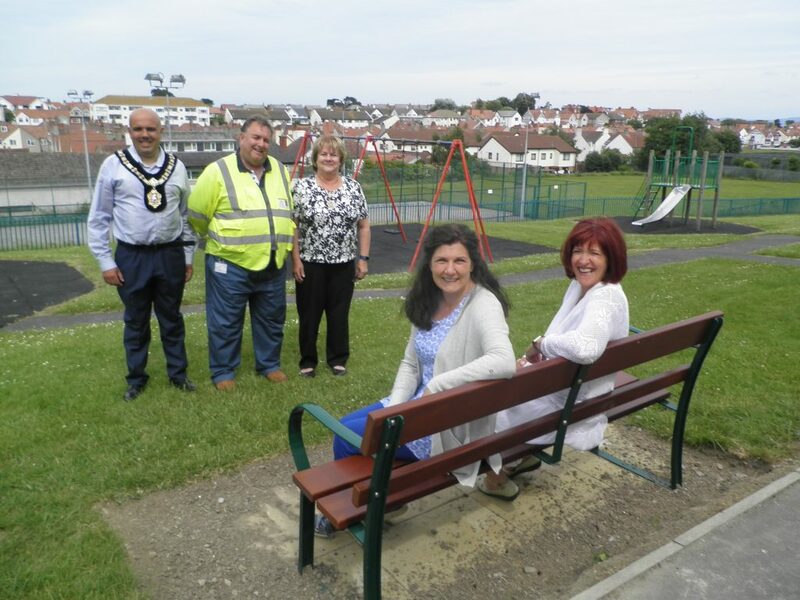 The Mayor of the Bay of Colwyn, Cllr Steve Williams, visited ‘Tucky park’ play area on Church Road, Rhos on Sea, earlier this week to officially unveil the two new park benches. Local resident, Mrs Lorraine Whitaker, had written to Town Councillor, Glenys Baker, around 18 months ago requesting extra benches in the park. There has only been one there for the past 15 years and, whilst this was in good condition, Mrs Whittaker felt more were needed for adults watching children play, or waiting to collect children from school. Councillor Baker approached the Town Council and local members got behind the scheme. Funds were identified from the local Council’s street furniture budget, the benches were ordered earlier this year and were finally installed last week, with the assistance of Conwy County Borough Council’s Open Spaces team. Photograph taken by Tina Earley, Town Clerk, showing the Mayor, Cllr Steve Williams, visiting Tucky Park with (left to right): Phil Vipond, Environment Officer for Open Spaces, Cllr Glenys Baker, Cllr Hannah Fleet and Catherine Smith, Parent Governor at Ysgol Llandrillo yn Rhos. 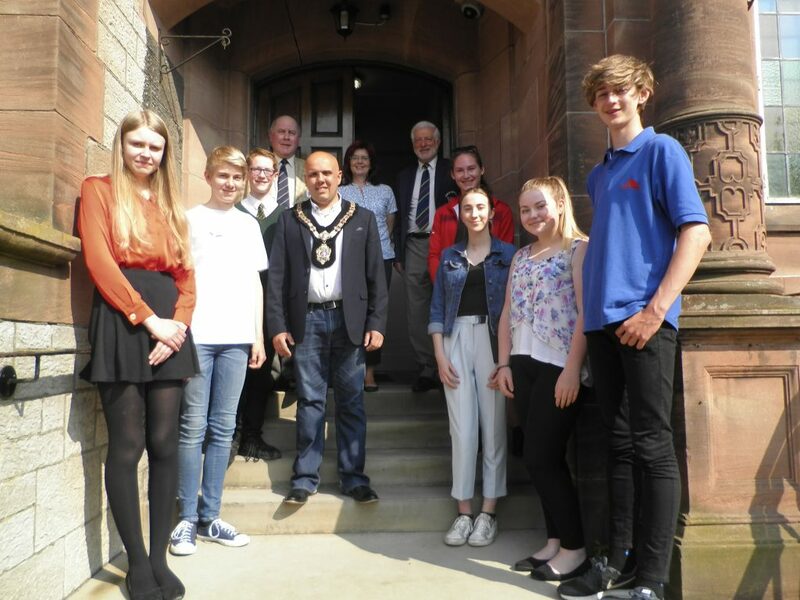 On Monday 4th June, the Mayor of the Bay of Colwyn, Cllr Steve Williams, was delighted to be invited to present grants, on behalf of the Trustees of the Sir John Henry Morris Jones Trust, to eight talented young people from the Colwyn area. The Trust was set up in 1975 with a bequest under the terms of the will of Sir John Henry Morris Jones, who was a G.P. in the Town for many years and M.P. from 1929 – 1950. Applications are invited annually by the Trustees from young people under the age of 19, who live in the former Borough of Colwyn area. The attached photograph is of the Mayor, Cllr Steve Williams, Mr Jim Barry, Chair of the Trustees, Cllr Tony Pearson and Mrs Val Smith (Trustees) and this year’s award recipients outside the Town Hall.